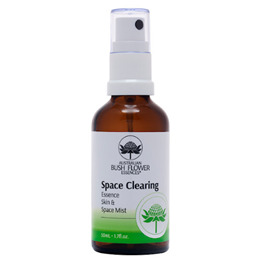 The Space Clearing Mist is a cleansing room, space and skin beauty treatment made from flower essences, essential oils, botanicals and herbs. May help to clear negative energies, emotional issues, and create a harmonious environment. Organic Aloe barbadensis leaf juice, Organic alcohol, Organic glycerin, Aqua, Polyglyceryl-10 Laurate*, Glycerin*, Juniperus virginiana (Cedarwood) oil, Lavandula angustifolia (Lavender) oil, Eucalyptus citriodora oil, Santalum spicata (Sandalwood) wood oil, Lobelia gibbosa essence, Adansonia gibbosa essence, Thysanotus tuberosus essence, Parmelia s.lat essence, Nelumbo nucifera essence, Chamomilla recutita (Matricaria) flower extract, Calendula officinalis flower extract, Organic Arnica montana flower extract, Echinacea purpurea root extract, sodium anisate*, sodium levulinate*, potassium sorbate, citric acid*, geraniol^, limonene^, linalool^. 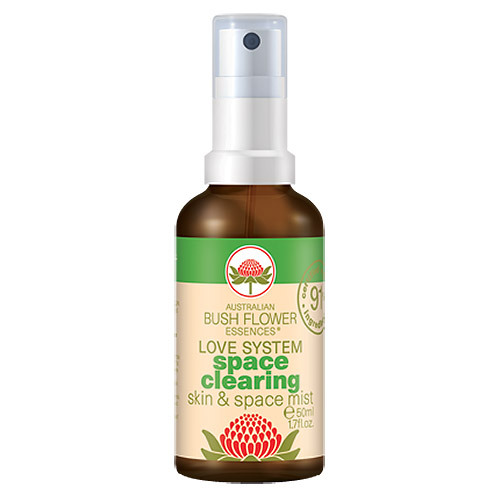 Below are reviews of Australian Bush Flowers - Space Clearing Mist - 50ml by bodykind customers. If you have tried this product we'd love to hear what you think so please leave a review. Exactly what I wanted and despite the snowy weather, arrived in reasonable time.